I hope you had a great weekend and your week started fabulous. Today I want to talk with you about magazines....As you all know (or maybe not), I am a student in Finland, but I am originally from Romania. I moved to Finland 2 years and half ago, but it’s not like a permanent move – I always go home on holidays. When I was living back home I was an avid reader of magazines – beauty, fashion it didn’t matter...I was really enjoying reading. When I moved here, I actually hoped that I will find some magazines in English, but to my huge disappointment, that didn’t happened. To partially solve the problem, every time when I’m going home I come back with some and also if my mom is sending me a parcel or something she is always adding some magazines. Also if I am in an airport or something I am looking always for magazines written in English. Anyways, here is where Zinio comes is in handy. You don’t know what Zinio is? Zinio is offering digital magazines subscriptions and honestly I wish I knew about them before. The sell subscriptions for thousands of magazines around the world such as Allure, Cosmopolitan, Glamour, Elle, Vogue, etc. Sounds pretty amazing, no? What is more amazing is that they can be read via PC, Mac, iPhone, iPad, Android or Kindle Fire. Right know, Zinio is offering up to 50% discount on selected titles that you can check here (offer ends on 19th of March) and also on if you buy for 15$ you get 7.5$ off next purchase (offer ends on 15th of March)! The most amazing part is about to come! 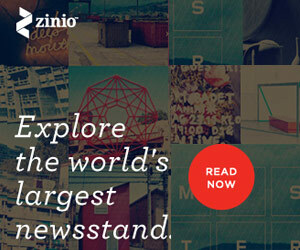 I’ve teamed up with Zinio to offer you 9 free subscriptions! YES, there will be 9 winners who can from any title on the wesite. Now, what do you think about that? All you need to do is to fill in the Rafflecopter widget below. This giveaway is open internationally, so GOOD LUCK everyone. For more information, read Terms and Conditions. Disclaimer: For hosting this giveaway, I will be compensated with a free subscription from Zinio. Please read my full disclaimer here. Fab giveaway! Cheers Cristina! Got my fingers tightly crossed! !